Just a quick post to announce that I’ve started my annual new conference attendee list on Twitter. I’ve been making a list each year since I went to my first ALA a couple years back during the “OH MY GOD WHY IS IT SO HOT” Washington DC conference. If this is your first conference, send me a message (@wawoodworth) on Twitter and I’ll add you on the list. If you’re a more experienced person attending the conference or want to live vicariously through the new folks, then be sure to follow the list. I won’t be in Chicago for the conference this year, but I look forward to reading, seeing, and hearing all about it from everyone headed to the Windy City. I had thought of this a couple of weeks back, but I had to wait till the holiday season passed to give it a go. Since #followalibrarian may or may not have been usurped by Twitter lists, I thought this meme would be something fun to replace it. Why toss a search into Google when you have your fellow librarians who can point you to nice sites they consult on a regular basis? Nothing quite like having an explanation and endorsement! Here is a saved search. I intend to go back and mine the links out of it. This is a quick entry to set something straight. 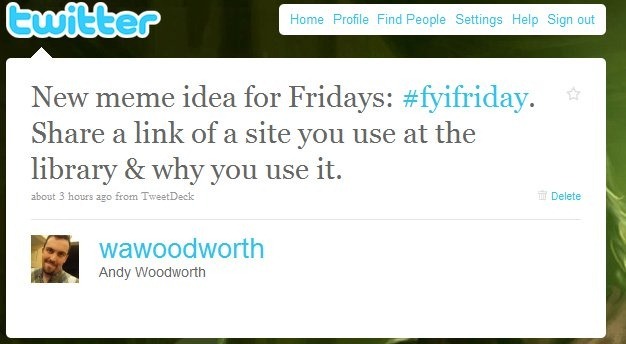 After some searching, I found the tweet that launched a thousand other tweets. 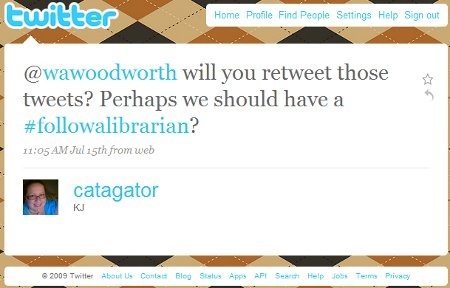 The origin of the hashtag #followalibrarian came from “KJ” (@catagator). Here’s her tweet to me that contained this awesome hashtag. So, I want to give credit where credit is due because the number of librarians I was able to follow because of her awesome idea was huge. Already, this is yielding dividends in articles, blogs posts, and other great sources. I’m looking forward to next Friday’s #followalibrarian. I’ll have to make sure to get my list ready! 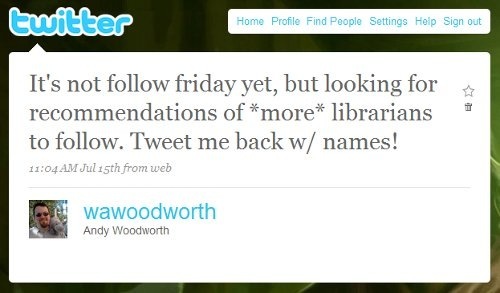 To provide the proper context of her tweet to me, I had been asking for recommendations for other people to follow. It was earlier this year when I realized that the song in the video above, “Fight the Power” by Public Enemy, was twenty years old. I remember when I was first introduced to Public Enemy back in high school. My friend Adam put on the album “Apocalypse 91… The Enemy Strikes Black” while we were playing video and board games. It was the first time I had been exposed to hip hop and shortly thereafter it became the first hip hop album I bought. I had never listened to any band with a social and political agenda before Public Enemy. “By the time I get to Arizona”, “Can’t Truss It”, and “Shut’em Down” were like shots being fired across my world perception bow born from my very mundane suburban living. I knew things were not right in the urban community, but I had never heard it told from street perspective. This cultural grain of salt has stayed with me through the years. However, like a lot of my fickle music interests as a teen, the album got heavy play for a month and then retired to a CD folder, rarely to be heard again. In the last couple of weeks, I’ve been keenly following the state budget battle out in Ohio. Governor Strickland had announced a 50% cut in funding to libraries as part of his proposed budget. Since a majority of libraries are state supported, this would mean the crippling and/or closing of many libraries around the state. I’ve joined and contributed to the Save Ohio Libraries Facebook group that was set up in order to organize rallies, distribute state legislator contacts, and public lobbying of the Governor. The genesis of this group has been phenomenal as it gained over 20,000 members in the first week (the current tally as of the time of this post is roughly 45,000). It is full of photos, links, video, and active postings on the wall and in the discussion boards. While I have not received a message from the group creator, I have been checking it (as well as following #saveohionlibraries on Twitter) for updates as to how things are working out. I can’t say that my posting presence on this massive group has gone unnoticed. Why posting about Ohio libraries if u r in NJ? My grandchild here in Cleveland can lose her storytime, yours? Because libraries are important, regardless of state borders. I just want to show my support! NJ has some budget cuts, but we aren’t in the same trouble as Ohio libraries! As engrossing as this whole situation was to watch unfold in the belly of social media, it was during a drive up to work where I had a thought that gave me significant pause: why is it that the library community can be this organized and passionate when it comes to budget battles and less visible during other times? (With the exception of book challenges, possibly.) Does it take being pushed to the brink of non-existence to ignite the fire in our bellies for our profession and rally the public to our noble cause? What can be done now to prevent putting ourselves in this position in the future? As it can be expected, I have a few ideas. We need to radically reframe the public and political dialogue about libraries. How? 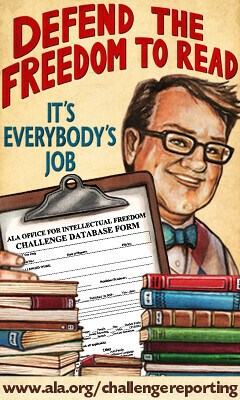 By advocating that libraries are an essential service of a modern industrialized society. Information literacy has become a new set of basic skills for people living in the developed world. Even if a job does not require them, it is more than likely you will need them to apply to that job as businesses move their employment applications online. Data is the new goal of our hunting and gathering ways, whether it is to determine the lowest airfare available, how to contact an old friend, or find out what the weather will be like tomorrow. Our materials (print, video, audio, web) are fuel for the human curiosity engine that resides in all of us. We educate, enrich, and enhance the lives of our patrons. Whether it is through materials or programs, computers or classes, or simply being there for our patrons when they are looking for someone to talk to, libraries matter to their communities. There is no private or government entity nor internet service or website that equates to the personal service we offer or the depth and breadth of information we can access. Our role in society is unduplicated, unequaled, and undisputed in this new age of information. In order to broadcast this type of message, it is pressing that we believe in it ourselves. There can be no false enthusiasm or facade to this belief; it must be complete and genuine. Personally, in seeing the passion presented by my peers at conferences and gatherings, this is perhaps the easiest aspect that I am proposing. However, I can see how it would be a true barrier in a world that minimizes and marginalizes the very mission of the library. It is imperative to rise above the critics, to instill ourselves with confidence about our restless profession, and to take pride for our service and toil on behalf of our patrons. For if we don’t believe that we are essential to the public, why should they believe it themselves? From this, I see the hardest yet most rewarding part: a sustained public movement towards the safeguarding and custodianship of the public library and its ideals. While moving towards this goal can feel Herculean, we are already surrounded by the necessary building blocks. Some of these are more familiar and “traditional” methods of building relationships with the community by getting to know your patrons and politicians. A Friend’s group can work as an extension of the library as each member becomes an ambassador of the library. Local media in the form of newspapers and radio stations provide a broadcast platform to reach out to the community. Encourage local politicians to define a stance on the library and library funding and invite them to come and see the collection for themselves. In addition, any marketing campaign that can be run (alone or in conjunction with a Friend’s group) at the community level should work to raise the visibility of the library. These tried and true methods are pretty universal for libraries around the country. On the other hand, there are the exciting new methods possible through web 2.0 social media. Witnessing the growth and development of the Save Ohio Libraries Facebook group has really reinforced this concept with me. For the price of time and effort, you can create content that can be used to reach out and interact with patrons far beyond the walls of the library. It is this extension into the lives of our patrons as a relevant and important service that will ensure the survival of the local library in the future. It latches onto the underlying appeal of constant and immediate contact as offered by text messages, email, and Facebook or Twitter-like updates. With the improvement of our communication technologies, this is the opportunity to groom this technological type of relationship with people. As communication methods grow, as different types of web based social networking appear, and as the product of information evolves, the library needs to be in step with these advances. Our patrons are moving along with the improvements, and so should we. The difference between the traditional methods and web 2.0 social media is that the latter is more personal since the conversation never ends. Beyond the aforementioned constant contact, it becomes a part of the information lifestyle that people have grown accustomed. We meld into the other popular web services that people use to manage their daily lives. The ability to order groceries online coincides with placing materials on hold; watching YouTube becomes no different than watching a movie on Overdrive; and calling or emailing the reference desk is seen as an upgraded internet search. Not only are the tools on hand, but there are more being developed and refined with each passing software innovation cycle. 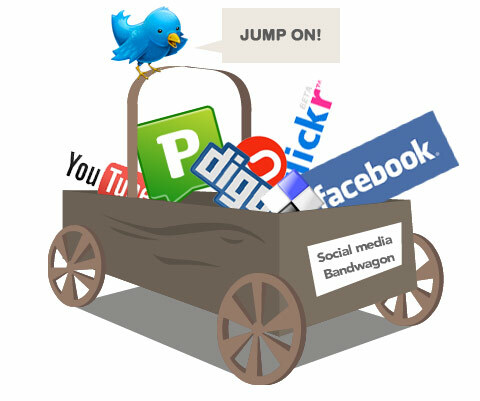 Twitter, Jaiku, Facebook, Myspace, Flickr, Picasa, Blogger, Livejournal, these are examples of social media of today; can you imagine what is down the road from these illustrious starting points? We will never lose the personal touch that is exemplified by more traditional patron relationships, but we should work to enhance it through the communication and information technological wonders of social media. For librarians looking towards the future of the public library, now is the time to create our own functional social networks for advocacy. Now is the time to forge new friendships and connections with librarians both local and national. And now is the time to share experiences and knowledge resources when it comes to organizing the library grassroots. It is through these bonds that we can support one another during the inevitable crises that play out across the country when the ideals of intellectual freedom are endangered, when our content is challenged, and when our very existence in the community is threatened. Librarians call upon each other to help with a reference question; how can we not call upon others to help one another weather the ideological storms? Our professional egalitarian ideals should not mean that we treat everyone equally yet suffer all of the hardships alone. We are now one immense information sharing entity, intricately connected through phone and ethernet. The closing of one library is a loss of a unique community resource to the whole system and we should treat it as such. This is not a call to replace specialty or state library associations in their advocacy roles, but to supplement them. Our assets are thousands of additional eyes and ears with computer savvy capable of finding and reporting information back to the others. It is an intelligence network staffed by passionate library professionals that extends wherever a library stands. With the increasing ease of user content creation, information sharing has never been easier for those who are bold enough to utilize it. This is a strength that we should seek to use for the benefit of libraries from coast to coast. So, I say to you, dear reader, who is with me? It’s a blog! No, it’s a microblog! No, wait, it’s a cocktail party! No, it’s something for you to be witty or interesting on so you gain followers! Wait, no, it’s the light infantry! But not for conferences! And not for mundane crap! For me, the conversation about Twitter closely resembles the tale of the blind men and the elephant. People are so determined to pin down what Twitter is and is not that they are missing the overall point: that Twitter is everything that people describe it to be. Want to share what you had for breakfast? Go for it. Want to keep tabs on a couple of friends? You got it. Professional networking? It’s there, just do it. Build up an online presence cult of personality? Tweet away, oh future internet trend despot. It is the Web 2.0 Mirror of Erised, a magical looking glass upon which a person can gaze at what they wish to see and input their say in their Twitter feed. How can it possibly be any simpler? While it might not be for everyone, with the proper external tools and some internet elbow grease, it can satisfy the most picky user’s expectations. For myself, I find that Twitter is the right balance of personal and professional. I can share my joys, woes, observations, and thoughts to a select (reasonably interested) crowd. 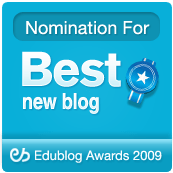 More importantly for me, it has become a valuable source of professional articles that offer tips and insights that I am certain I would not have found otherwise. My network of library professionals has expanded beyond my library system and granted me access to (what I can only think to call) a people database. These carefully cultivated contacts now exist on the local, national, and international level and put a spectrum of knowledge and expertise a mere tweet away. For me, that kind of raw information potential is captivating and powerful; and it makes me extraordinarily grateful to be in such a supportive profession. That is how Twitter has met and exceeded my expectations and why I continue to happily tweet today. Personally, I have a very unscientific and suitably unsupported theory about the low retention rates. I base this solely on my unwritten observations of Twitter, people in general, and related postings. I would be willing to bet dollars to donuts that the so called “retention problems” lay with the end user because they come to the service with unreasonable expectations. Whether it is the idea that a Twitter account will somehow magically grant them access to celebrities or consistently give them a specific type of information they are looking for or be the social happening place that it is at any given moment (your mileage with followers may vary), they are let down when the reality doesn’t match the hype. Sure, it looked good on Oprah, but beyond Oprah’s sparse tweets (51 in total, none towards any non-celebrity of her 1.6 million followers), what is there for these new members to do? They have been dropped off at the proverbial Promised Land without a guide or an incentive to stay. Even if they did not ride the mighty coattails of Oprah to the service, they could find the “noise” of uninteresting updates from those they follow to be a deal breaker for the service. Whether it is for personal contacts or professional information, the sheer volume of information that passes through their page feels insurmountable. They flail, they flounder, and then they flee. And it is when Twitter fails to meet a person’s presumed expectations of the service that they toss it aside like a stuffed animal that has fallen out of favor with an angry child. There has been much press about Twitter’s retention numbers and active accounts. I find the numbers being waved around to be rather uncompelling because they simply do not go far enough in their analysis. It does not account for lurkers (people who sign up for accounts simply to be able to read a list of who they follow), those who use it for marketing & research (read: data mining) purposes, and the spammers who constantly on the move within the service creating accounts (nevermind what counts as an ‘active’ account or the fact that you can be active on an account without followers). Find me in a year or two and then I’ll take a look at the charts again. Perhaps it is our ever increasingly small technology cycles, but I don’t believe that all businesses on the internet need to follow the explosive growth of Google, Amazon, or Facebook to prove long term success. More people are coming online, more people are embracing social media to maintain their relationships for different aspects of their lives, and the world is becoming more socially connected. Even if it’s only 10% of the people generating 90% of the content, that’s still a fair number of people generating a massive amounts of information. On Twitter, that is roughly 450,000 people based on the estimated 4.5 million accounts; it would be equivalent to the population of Luxembourg. (Or, for a much larger number to think about, 10% of active Facebook users would be approximately 20 million people worldwide. For comparison, that is just a little shy of the population of Australia). And it’s only going to get bigger. You can bet the cocktail party on that. This post can also been seen on LISNews.org. Maybe it’s just me, but I have reached the point of push back when it comes to social sites like Facebook, Myspace, and Twitter. The openness of the connections on the web has lead people to make the mistake of thinking that, since we know each other in real life, we should be friends in cyberspace. Since crumbling to the pressure to join Facebook, I initially liked the interface and the ability to keep in touch with friends and family. But like a teen with his parents away for the weekend, there seems to be a call out there that there is a party at my place and anyone can come. First, it was some of my old high school acquaintances who messaged me. There are only a few people from high school that I am interested in tracking, but these people were the ones I was interested in. Ok, not a problem, so I accepted them. At the same time, it was people I game with and enjoy their company at our once a month events. Sure, I enjoy their company at the game so why not keep tabs on them during the time between? It took me aback when some of my high school classmates wanted in. Sorry, but to be honest, if I haven’t spoken to you in the ten years since high school, I’m not super interested in talking to you now. Same for the friend of a friend people from the gaming events. I don’t even recognize your whole name, which is when my thoughts first started wandering down this path. And when people I can’t stand start trying to friend me on Facebook and Twitter, that’s when the line in the sand was drawn. Well, perhaps a line in the sand is not the right term. This is more of a Berlin-esque wall to keep the “good” people in and the “bad” people out. The explosive nature of social networks in the past few years has been breathtaking. The social groups had always existed but the ease of connection had not. As more people bring their lives online, the need for ease came about. And here, here is the tragedy in my story. It became too easy, too expected that anyone you have ever meet ever now has an access point to your life. I started to feel guilty as I brought the mouse over the Ignore button; I simply couldn’t do it at first. Why did I feel so bad about turning down people for “friend” status for my personal online social network? It’s not like I’m going to see them or talk to them or have to answer awkward questions like, “Why are you not my friend?” There is not much consideration on their part to become your friend as it is. More likely than not, they simply saw your profile come up, think to themselves, “Hey, I know that guy”, and clicked the “Friend Request” button. Hell, there is probably more consideration given to the choosing of a breakfast cereal than for a friend request. So why do I feel guilty? Perhaps it was because as a kid I was excluded by other kids from their play. Perhaps I don’t want anyone to feel the same way I did when I was told that I couldn’t play. Or maybe because the granting of a friend status is so minor, so silly, that who am I to deny it? Heh, I crack myself up at times. The more concrete, more accurate answer is one that I arrived to in college. High school forces you to interact with people you generally don’t like or don’t want to deal with; college frees you from the interaction. Sure, there are some annoying or obstinate people you will have to deal with, but the time spend dealing with them starts to reflect conditions in the real world: if you don’t have to deal with them, then you don’t have to deal with them. It’s that simple. So, to carry over this principle to social networks is a snap. There is one story I’d offer as an example. It has given me the strength to follow my conviction in this matter. During college, there was a very nice but very annoying person who used to tag along to meals with myself and my friends. It turned an average meal into a grating affair as this person sucked the joy out of the eating and socializing experience that was the dining hall. We were miserable, feeling powerless in our situation. One night, in lamenting this social quagmire, I suggested that we work out a system to avoid this person. It was a perfectly horrible yet wonderful utilitarian reasoning that brought forth a solution to the problem: the guilt we felt about ditching the person was minor compared to the aggravation and misery caused by bringing them along. So, we used the phones, messages in passing, and we successfully ditched the person most of the time from then on. Meal times once again became fun. The bottom line for me is that social network sites are the best way to keeping tabs and sharing life with the people I really truly care about. Some are old friends, some new, others from work, and still others from shared experiences and activities. If you don’t fall into those categories, then I’m sorry, but I really don’t care about what you are doing, I don’t want you to have the ability to comment on my activities, and I think we should lead our lives in parallel: never crossing. Even as I write this, it seems harsh, but the truth sometimes is. The social networks have turned the connectivity from a trickle to a flood, and I’m not interested in the noise outside my select social circle.